In the realm of travel photography its easy to get lost in the beauty of the locale but something about Richards images set him apart. Within 2014 alone Richard traveled to 13 countries and has been within his lifetime to 220 cities worldwide. His style focus is on Travel Magazines, Book Publishers, and Interior Designers for corporate art for hotel and office building clients. Richard's primary logo is made up of a type lockup that is unified by the dotted rule in the center of the mark that includes the secondary mark. This rule is meant to signify the travel aspect of Richards body of work. The secondary plane mark that is featured through out Richard's new stationery suite, marketing materials and new site. The color palette for Richard Silvers brand is strong, masucline and modern. Its simplistic color palette gives his work a clean and simple background to stand on. The palette captures the sense of masculinity with the use of the two primary colors Slate Grey and Silver Grey while still staying fresh with a pop of the Hearty Orange. The next evolution aspect of Richard's new brand was his stationery. The masculine and modern feel that was established in the development of Richards's new mark was brought into first his business cards which shaped the rest of the suite. The suite features a bold use of pattern as well as a pop of Richard's trademark hearty orange. The primary functionality of the site was to show Richard's portfolio of work. The new site didn't require any other additional functionalities so it was decided to go with a Squarespace template site. From there the site was customized to fit within Richards new modern masculine brand. The simplicity of Richard's secondary plane icon is the perfect choice for his new favicon. A vital part to any photographers brand is their marketing materials. 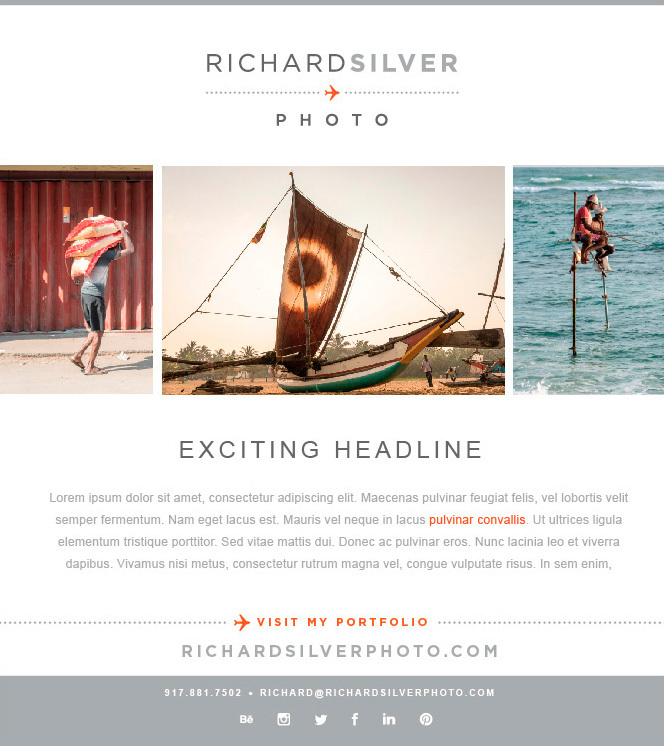 For many photographers that includes both a print promotion piece and a emailer template. For Richard's new print promotion piece sets of cards were created that each had a different image on the back. This created a mini world tour of Richard’s work. The promo also featured the number of locales that Richard has shot in over the years. 220 cities and 75 countries to be exact. The promotion was mailed out in sets of five cards in a clear envelope with a wrap around label that was designed as part of his stationery suite. For Richard's emailer the modern clean aesthetic was brought into a emailer template that could be used over and over again with different copy and images.